I’ve got another project to share using my old Reader’s Digest books! 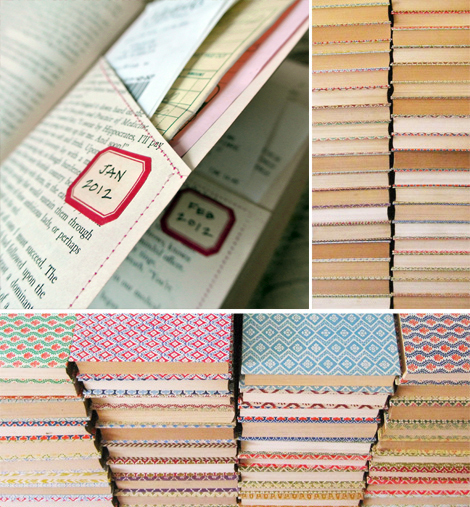 This one is for creating pockets from pages within the book for stashing and organizing things like monthly receipts. You can find the step-by-step on my post over at SC Johnson Family Economics. Please share your book ideas in the comments of the SCJ post, I love reading them! This entry was posted in Book Crafts, Family Economics, organizing, SC Johnson. Bookmark the permalink. I think this is a very clever idea. Thanks for sharing. I need to look for some old Readers Digest books. I love these! They are so adorable! I think I may adapt these to fit my product packaging! I use old books and turn them into little fairy houses. They have three floors: bedroom, eating area and a livingroom. I have also done books for Halloween and Christmas, plus they are easy to store on a bookshelf. Do you have pictures and tutorials on how to make your little fairy houses? You’ve got me mesmerized. I’d love to see how they look like! Wonderful idea! I love seeing all the different ways you use your Reader’s Digest books! I have a bunch too, so I will definitely give this a try! This is such a great idea! Thank you for sharing it with me. I had to pin this too!!! What a cool idea! Recycling rocks! This is so wonderful! I can’t wait to make pocket books from my stash of “junk” books! Maybe you have done this (you have done so much I can’t keep up!) But I have glued all the edges of pages of a Reader’s Digest book together, then cut out the middle with a box cutter and a straight edge, leaving only the front cover free. This is then used as a ‘bank’ (safe) or a place for your ‘treasures’ to put up on a shelf. Of course, no one would have a clue you have your ‘valuables’ inside these books! It’s a little tedious but worth it in the end! I just tried this and it turned out fairly well. My biggest issue was keeping the pages flat and even. Most of the pockets turned out a bit skewed. I’m pressing the book under something heavy right now and I hope that helps. Thanks for the idea! LOVE this idea. But my favorite part was when you said above, “Please share your book ideas in the comments of the SCJ post, I love reading them!” I will assume you didn’t mean that as a pun. But I adored it either way! Have a great day and thanks for sharing a wonderful idea! Such a great idea Cathe – I often see books I like the look of in charity shops but know I wouldn’t read them. I usually leave them for someone else but now I can buy them with purpose in mind. that sounds lovely. Do you have pictures? What a clever idea. I’d love to try and make one someday! Love it! ❤ i’m plannin on doin somethin similar for my a’levels! Your link to SC Johnson is no longer working… Right as i was thinking about doing this!